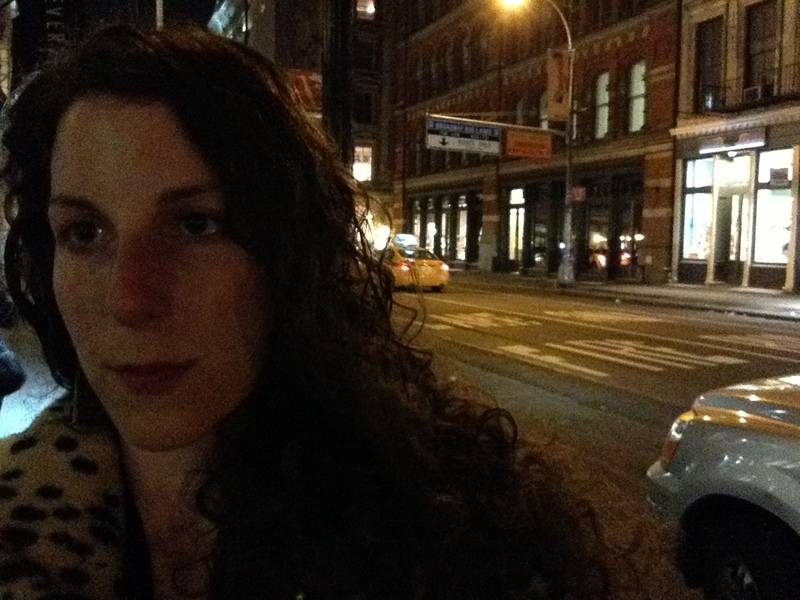 Poet and artist Amanda Deutch blogs about P&W–supported Parachute: the Coney Island Performance Festival, a literary nonprofit she founded in 2009. Parachute hosts a festival in the fall, free writing workshops, and innovative poetry happenings in Coney Island, New York. She is the author of four chapbooks: Gena Rowlands (Sounds Nice), Box of Sky: Skeleton Poems (Dusie Kollektiv 4), Motel Drift, and The Subway Series. She is also the recipient of a 2007 Footpaths to Creativity Fellowship to write in the Azores Archipelago. Deutch lives by the water in Brooklyn, NY, and plays skee-ball in her free time. From street signs to carnival talkers, from the Chief hawking fresh clams with a call of, “Hey! Get it! Get it!” to the influx of monarch butterflies in late August, there is poetry in the everyday language that surrounds us. I want people to stop and notice poetry in daily motions. That’s part of my job as a poet. Parachute: the Coney Island Performance Festival is the manifestation of these desires. Since I was a young poet, I’ve thought of ways to make poetry appealing, accessible and to draw attention to the poetry that is all around us. I founded Parachute, a community-based literary organization, in 2009 to host a free two-day festival that features an array of local poets and writers. The writers read in front of an ethereal blue floor- to-ceiling tank of jellyfish in the New York Aquarium. Throughout the year, Parachute leads creative writing workshops, curates innovative poetic events, and celebrates Coney Island’s vibrant literary culture through readings, broadsides, workshops, and attention to the luminaries that have been inspired by Coney’s shores—Walt Whitman, Muriel Rukeyser, and Henry Miller, to name a few. The grants we receive from Poets & Writers are instrumental in helping us pay writers to lead workshops during the festival. These funds, along with other grants enable us to invite amazing New York poets and writers to read and lead workshops in an underserved neighborhood. We believe it is important to pay writers, both established and emerging, for their work and want to continue to do this in a field where this is not always the “norm.” Through grants such as the one from P&W, we are able to keep the Parachute Festival and its writing workshops free so that anyone who would like to can attend. It is very important to us that this continue to be accessible and welcoming to people who live in the community. Coney Island has arts and culture for those who come and visit, but not so many opportunities for those who live there. This festival is designed with the neighborhood as well as greater New York in mind. Photo: (Top) Amanda Deutch. 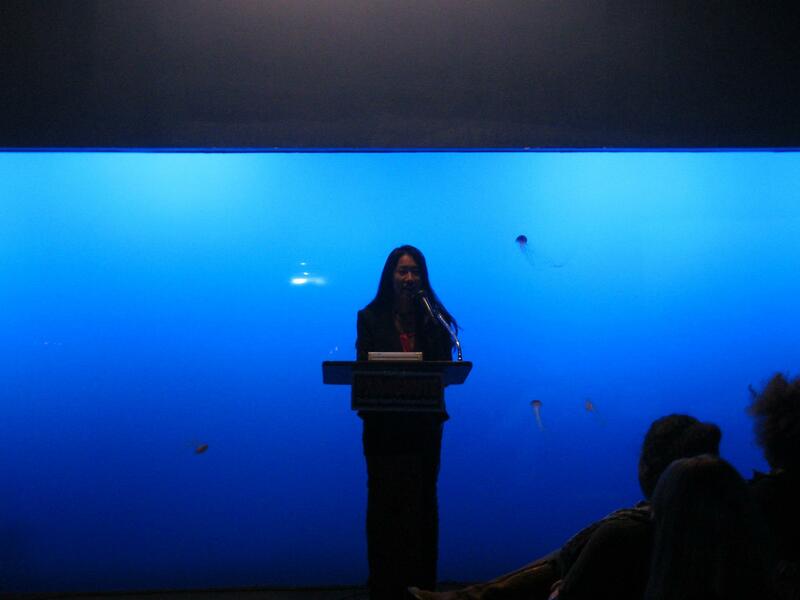 (Bottom) Tina Chang reading in front of the jellyfish at the Coney Island Aquarium. Credit: Amanda Deutch.